From the publisher: "When novelist Owen Quine goes missing, his wife calls in private detective Cormoran Strike. At first, Mrs. Quine just thinks her husband has gone off by himself for a few days. But as Strike investigates, it becomes clear that there is more to Quine's disappearance than his wife realizes." I love this series, but proceed with caution: there are some pretty gruesome descriptions. I did a lot of skimming to get through the grisly parts. (This wasn't the case with The Cuckoo's Calling.) Add Audible narration for $12.99. 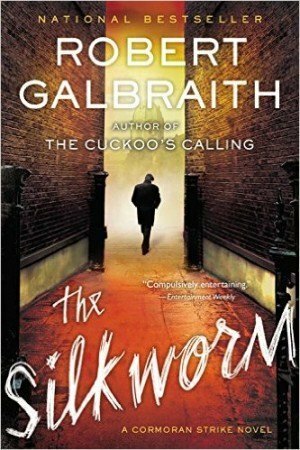 Private investigator Cormoran Strike returns in a new mystery from Robert Galbraith, author of the #1 international bestseller The Cuckoo’s Calling. When novelist Owen Quine goes missing, his wife calls in private detective Cormoran Strike. At first, Mrs. Quine just thinks her husband has gone off by himself for a few days–as he has done before–and she wants Strike to find him and bring him home. But as Strike investigates, it becomes clear that there is more to Quine’s disappearance than his wife realizes. The novelist has just completed a manuscript featuring poisonous pen-portraits of almost everyone he knows. If the novel were to be published, it would ruin lives–meaning that there are a lot of people who might want him silenced. A compulsively readable crime novel with twists at every turn, THE SILKWORM is the second in the highly acclaimed series featuring Cormoran Strike and his determined young assistant, Robin Ellacott.